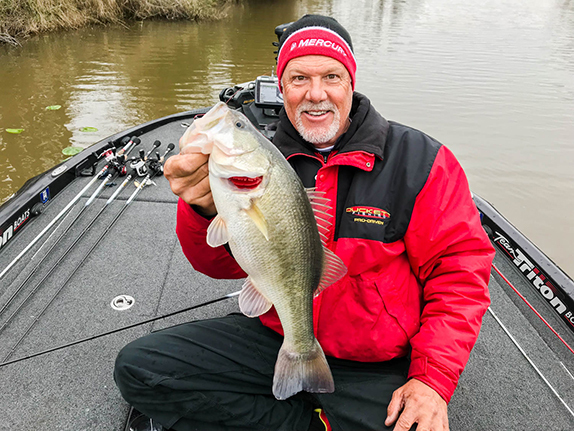 Going back to his roots as an angler, Greg Hackney is no stranger to fast-flowing water and uses several tactics to trigger bites from fish in those conditions. 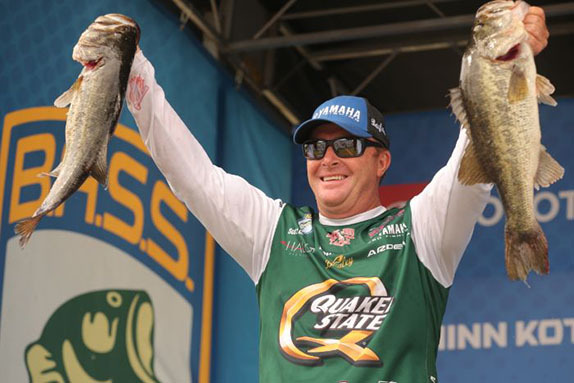 Growing up in Arkansas, Elite Series and Major League Fishing pro Greg Hackney was no stranger to fast flowing water. The Arkansas River can push 90,000 to 100,000 gallons per minute on a given day. That provided him with the perfect training ground for some of the waterways he has frequented on the Elite Series trail. A place like the St. Lawrence River, where rough water and strong current are common, doesn�t even phase him. Hackney has an uncanny knack for figuring out the very fish that frustrate others. 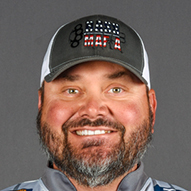 He�s been known to fish heavy jigs and win tournaments with them while other anglers employ finesse tactics. He�s apt to pull into a stretch that has been pounded all day, only to pull out a lunker. Hackney doesn�t like community holes and he doesn�t fish anyone�s style but his own. He also has no problem sling-shotting baits in hard to reach places. When you measure his consistency over the span of his career, he�s found a system that works and dialing in how fish position is part of that. Hackney is more of a fan of fishing clear water than dirty when the wind is howling. He believes it makes bass more aggressive. In those circumstances, he�ll worry less about sliding a jig beneath a dock and more about fishing the corners and edges of it. When targeting bass holding on a drop off, strong winds would pull them on top of it. Be it a stump, laydown, boat dock, or a grass bed Hackney has witnessed bass pull to the point of a grass bed or sit in front of cover when the wind blows and not only can he fish much faster, he doesn�t have to be as thorough. He�s able to fish faster by upsizing a half-ounce jig to a �-ounce model. Not only does it fall quicker, it is easier to pitch and it gives him better feel. He guarantees a lighter bait would result in missed bites since it doesn�t telegraph as well. �With a jig, you need to be able to feel what is going on,� Hackney said. 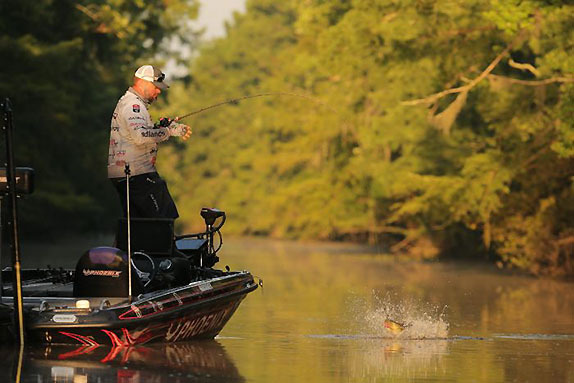 Hackney stresses the key to catching more bass is making every cast as if you believe you are going to catch one. While current intimidates some anglers, Hackney�s experience tells him that when current rushes against a piece of structure there will be a �dead spot� in front of and behind the object where bass rest. On the Arkansas River, he fished the downstream side of the wind dykes. Eventually, jetties were installed perpendicular to the river channel to help break the raging current. He could barely work the current without standing on his trolling motor at full throttle. In depths 10 feet or less he uses his Power Poles to anchor down. A 1-ounce Strike King jig bearing his name allows him to not only maintain feel, but alllows him to fish more efficiently. He realized that he needed a bait that would not only fall straight down, but right into the dead spot in front of the jetty. Only when bass were especially fussy would he scale down his jig weight. He pointed to his Pickwick Lake FLW Tour win in 2014 where he caught all his bass from a shell bar with live mussels on it. He caught every bass from the 8-foot section on the upstream point. �It was a huge flat that had a slight break on it and it made a point and the shells got on the best place because they sit there and wait on the food to be brought to them by the current,� Hackney explained. He had those fish pinned down right in front of that break, a giant school that he fished for 4 days where every smallmouth ranged from 4 1/2 to 5 pounds despite smaller largemouth being mixed in. 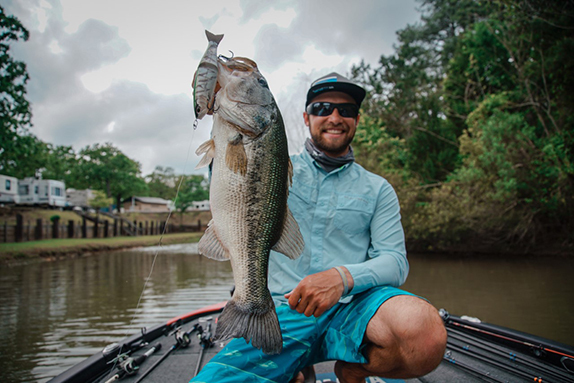 He caught some of his winning fish on a crankbait and a swimbait, but he admitted that half of the bass he brought to the scales were caught on a �-ounce Strike King Structure Jig. He threw it upstream and dragged it into the face of the object to make sure the bait got under the lip since the fish were feeding on the upstream side. When clouds crowd out the sun, Hackney will first try power-fishing before working the bottom. When he took 14th at the 2017 Lake Dardanelle Elite Series, Hackney caught his fish cranking as they were cover oriented the first two days. As there was a significant amount of shad in the water, when he did catch a bass it was 10 feet off of the stump he was cranking, but they were suspended in 6 to 7 feet of water. Once the clouds came out, they hunkered down on the bottom and he finished up fishing a big worm dragged along the bottom. Simply, he�d pitch out a worm and pick it up, letting it pendulum back along the bottom towards him. Rick Clunn - "What really got me wanting to do this was in 1984. I was 12 years old and my father and I attended the last day of the Classic at Pine Bluff. And I like the way Rick does things. He doesn't get any help." Lower Arkansas River delta (Pendleton area) - "That's where I was born and raised, and I still love to fish it." "I really don't have one, but for some reason I have a lot of trouble in Alabama. I like the lakes, but haven't done well there." Father - "He has a really good work ethic, and taught me a lot about life." "I like to hunt deer with a bow and rifle." "I love to catch them, and I just love the outdoors."